A unique source for antique and vintage jewelry. Estate Jewelers, Ltd. offers an unrivaled selection of vintage, antique, and estate jewelry. You will be delighted with the one-of-a-kind treasures you will see while perusing our showcases. In addition, we offer you the knowledgeable, caring attention that only a family-owned business can provide. We have been conveniently located in the heart of downtown Barrington, next to the historic Catlow Theater for more than 20 years. Mid century to present 14k - 18k gold charms, rings, bracelets, earrings, and necklaces. We are always seeking to purchase individual pieces or entire collections of jewelry, watches, and coins. When in doubt, bring it in! We are happy to provide an evaluation free of charge, there is no obligation to sell. Please call to schedule an appointment prior to arriving. Click the image to view our gallery. Here is a collection of images taken at Estate Jewelers. Jewelry appraisals are available by appointment only. © 2016-2019 Estate Jewelers, LTD.
We do not have any upcoming events at this time. Check back soon! 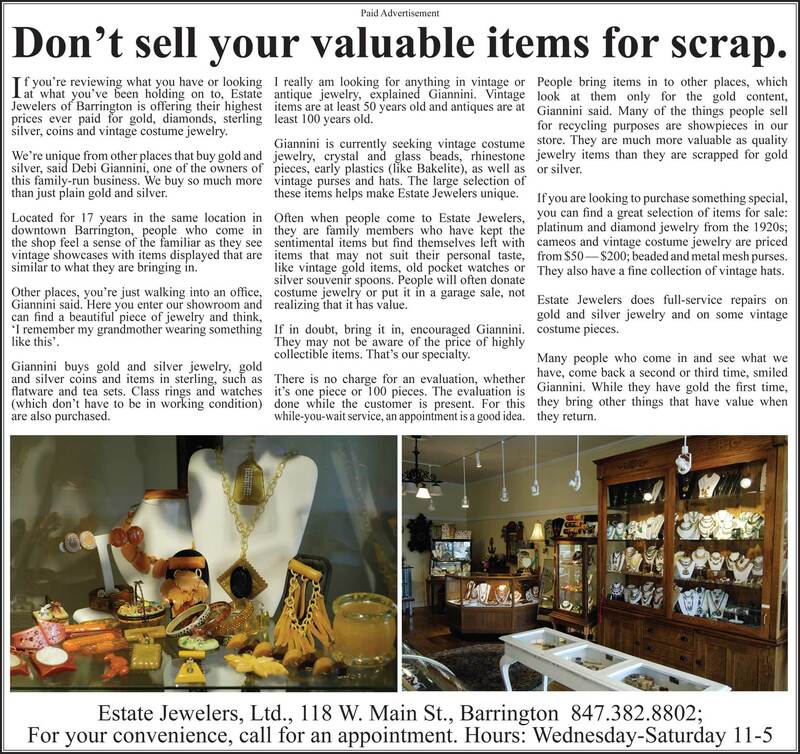 Estate Jewelers in the News!